SustainFloyd’s Personal Climate Pledge asks YOU to be intentional about what you eat, drive, wear and throw away. I post it here for the couple of Fragments readers who might stop by. Some of you have seen/heard this on Facebook from WVTF starting yesterday. 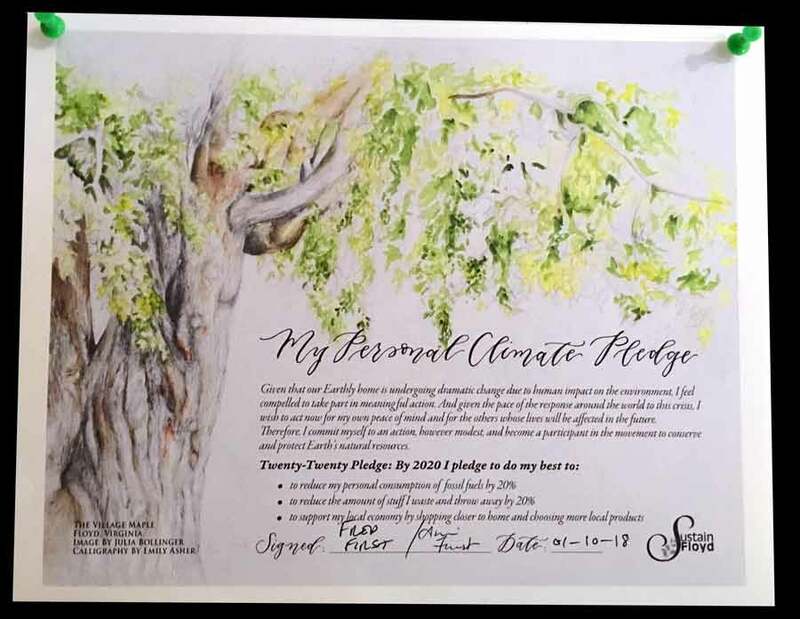 Robbie Harris put together a piece showcasing the Personal Climate Pledge created and now offered to all from SustainFloyd. The ultimate goal for me would be that we would stand against business-as-usual economics where GDP measures the health of our state in the world. People and planet must be at least equal priorities to profit. All the goals of the climate pledge swim against the current of using up faster, spending more, consuming more, traveling more and eating thousand-food-mile groceries. That is what I hope people with the Pledge magnet on their refrigerators will reflect on every time they do the “right thing” in their own homes. In the end, we have to make these principles the new order in our relationship with the natural world. ► You can help by sharing this post or the link to the WVTF spot on the Pledge. The link to the broadcast came up “page not found.” I hope you can fix it! I love the idea of a signed ‘pledge’. Makes it real and more official!